Ideal wrinkle reduction is achieved by replenishing your skin’s lost volume. Natural results are clinically proven to last a year or more in many patients. 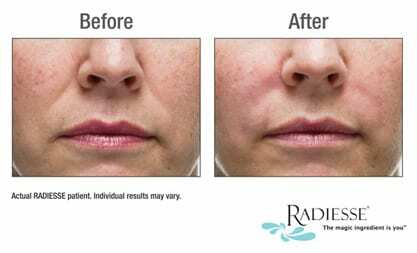 What is RADIESSE® Volumizing Filler? 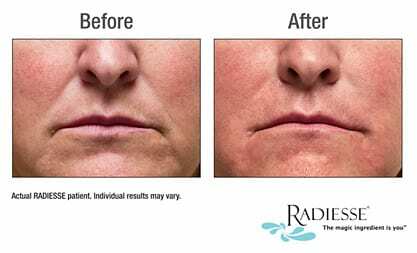 RADIESSE Volumizing Filler is an injectable filler that works by immediately restoring facial volume to smooth out the signs of aging. Once injected, it works with your body to stimulate the production of your own natural collagen for results that may last a year or more in many patients. What is the difference between RADIESSE Volumizing Filler and other fillers? 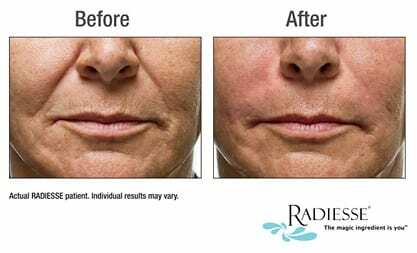 RADIESSE Volumizing Filler has the unique ability to both immediately restore lost volume and stimulate your body to produce its own natural collagen for long-lasting results. 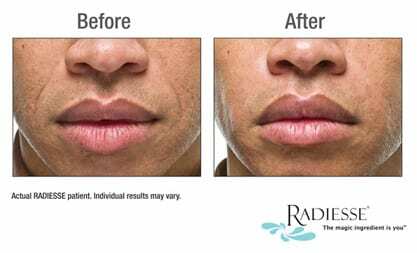 Once injected, RADIESSE Volumizing Filler does exactly as it says: it fills or replenishes volume lost over time for a more refreshed looking you. Then it goes to work by stimulating your body to produce its own natural collagen. Over time, your body absorbs the product and leaves behind only your own natural collagen for long-lasting results. Instantly! Immediately upon injection, RADIESSE Volumizing Filler restores volume to smooth out the signs of aging. That is the best part about RADIESSE Volumizing Filler – it is affordable! Because of multiple syringe sizes, RADIESSE Volumizing Filler can treat a broad range of patients based on their individual needs. Just one syringe can provide full correction! During a consultation, your healthcare provider will be able to determine what syringe size is best for you and provide you with a customized cost estimate. RADIESSE Volumizing Filler is FDA approved to mix with lidocaine (an anesthetic). That means you can experience a more comfortable wrinkle treatment. In fact, in a clinical study, using RADIESSE Volumizing Filler mixed with lidocaine significantly reduced pain in 90% of patients treated. 1 Berlin A, Hussain M, Goldberg D. (2008) Calcium Hydroxylapatite Filler for Facial Rejuvenation: A Histologic and Immunohistochemical Analysis. Dermatologic Surgery, Volume 34, S64-S67. 2 Bass LS, Smith S, Busso M, McClaren M. (2010) Calcium Hydroxylapatite (Radiesse) for Treatment of Nasolabial Folds: Long-Term Safety and Efficacy Results, Aesthetic Surgery Journal, 30 (2), 235-238.